AKIPRESS.COM - Bolortsetseg “Bolor” Minjin inherited a fascination for dinosaurs from her father, a paleontologist, eventually becoming one of the few Mongolian women to earn a Ph.D. in paleontology. Now Bolor is encouraging a new generation of homegrown fossil hunters with the planned launch of several regional dinosaur museums, reports National Geographic. There’s plenty to put on display. Mongolia’s Gobi desert is the world’s richest fossil area, overlying vast lakes and rivers that were a prehistoric paradise for plant life and dinosaurs. Desert sands buried some of the most complete skeletons ever found, along with large caches of dinosaur eggs. Yet Bolor, who has worked the Gobi for the last 20 years, notes that few of her country’s children have the knowledge or fascination for dinosaurs typical of kids elsewhere. “Despite so many fossils in their backyard, dinosaurs are more of a mythical creature to kids in my country, because there have been no resources to learn about them,” says Bolor, a 2010 National Geographic emerging explorer. After receiving her doctorate from the City University of New York in 2007, Bolor established the Institute for the Study of Mongolian Dinosaurs in Ulaanbaatar, her hometown and Mongolia’s capital. 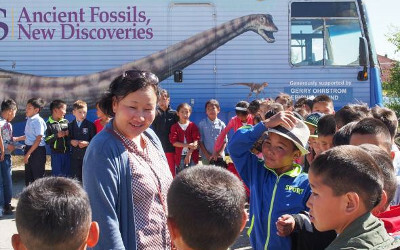 When she learned that the American Museum of Natural History was willing to donate a mobile dinosaur museum used in metropolitan New York City, she raised $30,000 through an Indiegogo campaign and private donations to cover shipping costs to Mongolia. The retrofitted, 10-year-old recreational vehicle began outreach programs to nomadic tribes in the Gobi and towns in western Mongolia last summer. The bus recently left Ulaanbaatar for a monthlong tour of the Gobi and western Mongolia. But in a predominantly poor, rural country more than twice the size of Texas, Bolor hopes to establish more lasting solutions. “It’s challenging driving the bus,” says Bolor, who spent several weeks just trying to find tires. She ultimately spent $3,500 to buy and ship them from New York. That helps explain why she’s trying to raise money to fund seven permanent dinosaur museums – one for each region where fossils have been found – by 2018. Some costs could be borne by host communities. The first is planned near the Gobi’s Flaming Cliffs site, in southern Mongolia, where the first dinosaur eggs were discovered in the 1920s by American paleontologist Roy Chapman Andrews. While educating future generations of potential paleontologists and encouraging tourism, Bolor hopes the museums will also inspire local communities to combat fossil poaching and black market sales, a decades-old problem.